Ideal Industries PowerPlug™ Model 103 2-Pole fully nylon insulated luminaire disconnect accommodates solid conductor of size 12 - 18-AWG, 16-Strand conductor of size 18-AWG, 19-Strand conductor of size 12 - 14-AWG and 26-Strand conductor of size 16-AWG. It withstands voltage rating of 600-Volts. 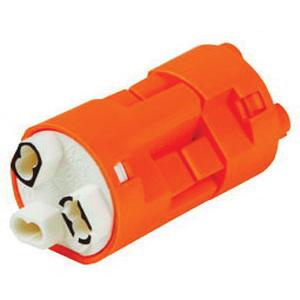 This 2-Wire disconnect in orange color, has nylon body for longer endurance. Disconnect has overall length of 1.48-inches. It employs push-in technology to ensure quicker connections, save time and increase productivity. This 0.74-Inch Dia disconnect fits through 1/2-Inch knockout. It withstands temperature rating of 105 deg C. It has V-0 flammability rating per UL 94 to withstand harsh environmental conditions. Disconnect is UL listed, CSA certified, RoHS compliant and meets CEC/NEC standards.